In a doctoral program noted for its accessibility, thanks to courses delivered online and via other technologies, one student puts the notion of “distance” in an entirely new light. Lt. Col. Joel Briske is a student in the UW College of Education’s adult and postsecondary education program, working toward a doctor of education (EdD) with an eye toward a spring 2014 graduation. He’s making steady progress toward that goal. At the moment, he’s making progress from Afghanistan, where he is deployed as a combat adviser for the 2/3 Afghan Civil Order Police. Briske’s team advises the battalion on a range of processes, e.g., security operations, logistics, communications and personnel. 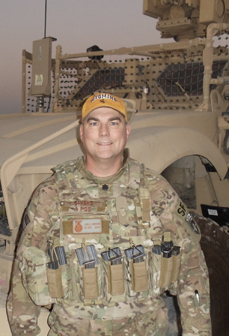 Briske has integrated lifelong learning across his 24 years of active duty in the Air Force. Joel enlisted at age 17 (with the required parental permission) and served 10 years as an enlisted member before entering a commissioning program at the University of New Mexico (UNM). He had already earned an AAS degree in criminal justice the Community College of the Air Force and was on his way to earning a BA in criminology (1996) from UNM. An MA in management (1999) from Webster University followed. All along the way, Briske moved to wherever in the world that his next Air Force assignment took him. One of those deployment stops was Greenland, where Briske moved from student to educator, While stationed at Thule Air Force Base, he set up and operate an extension campus of Lake Region State College (LRSC). The program delivered lower-level college courses to military personnel for the college, which is based in Devils Lake, N.D. He created and ran a similar program for LRSC while stationed in Las Vegas. Briske’s interest in education was ignited. He began envisioning a doctorate as an important next step, so much so that he requested that his next assignment be near a major university. Then the military transferred him to F.E. Warren Air Force Base. “I thought I was dead in the water,” he says of the Cheyenne assignment. But he didn’t give up hope. “Once there, I started looking around at the surrounding universities. I was still dead set on attending a brick and mortar institute.” Briske’s criteria for a graduate program led him to the University of Wyoming, 45 minutes away from Cheyenne, and UW’s doctoral program in adult and postsecondary education. An exploratory visit to the College of Education uncovered the right mix of program, accessibility and affordability. The program’s flexibility (many classes are offered online) is a bonus for someone whose job takes him to the far corners of the earth. “ I am fortunate to have the opportunity to be in a doctoral program,” Briske says. “This understanding keeps me motivated to overcome still looming obstacles. Time, distance and travel are my arch enemies. I have come to learn to travel with an office style speaker phone (so the rest of the class does not have to listen to me breathing) and to always be cognizant of where I will be and what type of connectivity while I have while I am taking classes. While the participation challenges that Briske will face in his next assignment likely won’t be as intense as those he’s facing now, the flexibility of UW’s program will continue to be an asset in his quest for a doctorate. Joel and his wife would like to return to Wyoming after he retires from the Air Force. Among Briske’s awards and decorations are the Meritorious Service Medal with one Bronze Oak Leaf Cluster, Joint Service Commendation Medal, Air Force Commendation Medal with four Bronze Oak Leaf Clusters, and the Air Force Achievement Medal with Silver Oak Leaf Cluster.